Apple’s HyperCard stack-based programming tool continues to astound me. This time, it’s the Poor Man’s Newton – a HyperCard stack that lets you muck around with Newton-like features on your Classic Mac desktop. Download a copy off UNNA, open up the stack, and bam – a fun Newton OS emulator that uses HyperCard buttons, input fields, and drawing tools. 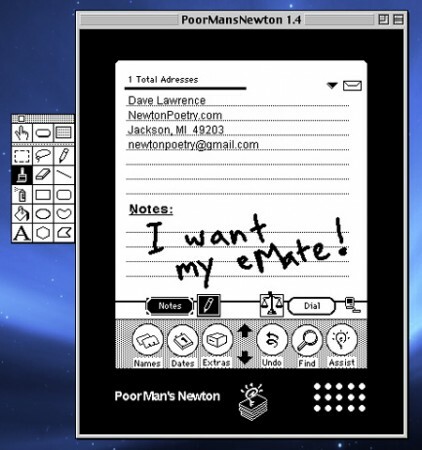 Poor Man’s Newton is a HyperCard stack that contains address and telephone information and generally behaves like Apple’s new Personal Digital Assistant (PDA), the Newton MessagePad. If you are like me and you can’t afford to buy one of these high tech tools, here is your chance to own a virtual one that can used on your Macintosh. At the time, cost was a real issue. These days you can find a quality working Newton for $30-$100 on eBay. But Poor Man’s Newton? That’s free. You don’t get the full MessagePad experience. PMN’s “Dates” functionality only shows a calendar – you can’t save appointments or reminders. If it did, Poor Man’s Newton could serve as a stripped-down version of Claris Organizer (also available at UNNA, for Mac OS 9 and older). Poor Man’s Newton offers a few other functionality items: unit conversions, a telephone number dialer, and plenty of printing and sorting options to keep a well-organized contacts list. 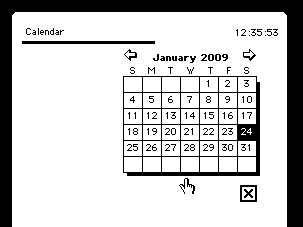 The HyperCard stack itself dates to a few years after the OMP was release (above), but it holds up remarkably well after all these years. It sweeps away everything else on your Mac desktop, acting as a distraction-free, Einstein-like app for those without a Newton ROM or a bunch of free time. Super fun to play with if you have access to a Classic environment, Poor Man’s Newton is very small (at 1 MB) and very affordable (free!) – and you don’t need a version of HyperCard to run it. Posted by davelawrence8 at 7:57 am on February 2nd, 2009. One comment... » Categories: software. Tags: classic, emulator, hypercard, mac, messagepad, newton, stack. Subscribe via RSS. Leander Kahney’s profile on Bill Atkinson, the original designer of Apple’s super-cool program HyperCard, has some folks feeling nostalgic for easy programming and cards arranged in stacks. Which is cool. 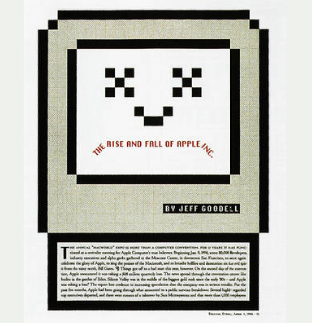 Stories about companies keeping inventory and invoicing duties on HyperCard – still to this day – remind us that old-school Apple is still usable and practical. But how about for the Newton? Well, there’s NewtCard. lets you put text, drawings, pictures and sound into a stack of smart cards. Add buttons to navigate, fields to collect data and scripts to bring your project alive with the tap of a pen. 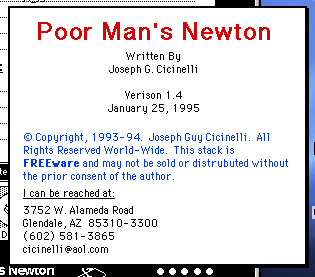 NewtCard is a Hypercard-like environment for Newton devices. This according to NS Basic’s FAQ. I’ve only played around with HyperCard on my Mac SE, but it seems HyperCard was an earlier version of HTML forms. In fact, Atkinson laments that his hyper-creation didn’t involve networking, or else it could’ve become the first (hyper)Web. A hundred bucks seems like a steep price for something to play around with on your Newt, but what the hey – HyperCard still has paying fans. Why not for MessagePad users? Even better? NS Basic is offering a package deal: NewtCard AND NS Basic/CE for $99.95. Order it here. Posted by davelawrence8 at 7:56 am on June 4th, 2008. No comments... » Categories: newton, software. Tags: card, HTML, hypercard, messagepad, newtcard, newton, web, wired. Subscribe via RSS.